Activation of the transcription factor nuclear factor (NF)-κB by proinflammatory cytokines plays an important role in beta cell demise in type 1 diabetes. Two main signalling pathways are known to activate NF-κB, namely the canonical and the non-canonical pathways. Up to now, studies on the role of NF-κB activation in beta cells have focused on the canonical pathway. The aim of this study was to investigate whether cytokines activate the non-canonical pathway in beta cells, how this pathway is regulated and the consequences of its activation on beta cell fate. NF-κB signalling was analysed by immunoblotting, promoter reporter assays and real-time RT-PCR, after knockdown or overexpression of key genes/proteins. INS-1E cells, FACS-purified rat beta cells and the human beta cell line EndoC-βH1 exposed to cytokines were used as models. IL-1β plus IFN-γ induced stabilisation of NF-κB-inducing kinase and increased the expression and cleavage of p100 protein, culminating in the nuclear translocation of p52, the hallmark of the non-canonical signalling. This activation relied on different crosstalks between the canonical and non-canonical pathways, some of which were beta cell specific. Importantly, cytokine-mediated activation of the non-canonical pathway controlled the expression of ‘late’ NF-κB-dependent genes, regulating both pro-apoptotic and inflammatory responses, which are implicated in beta cell loss in early type 1 diabetes. The atypical activation of the non-canonical NF-κB pathway by proinflammatory cytokines constitutes a novel ‘feed-forward’ mechanism that contributes to the particularly pro-apoptotic effect of NF-κB in beta cells. The online version of this article (doi: 10.1007/s00125-015-3817-z) contains peer-reviewed but unedited supplementary material, which is available to authorised users. Type 1 diabetes is an autoimmune disease in which insulin production is compromised due to pancreatic beta cell loss . This is mostly mediated by T cells and macrophages that invade the islets in a process called insulitis . During insulitis, both immune cells and beta cells secrete inflammatory mediators such as chemokines, cytokines, cell adhesion molecules and nitric oxide (NO), which further activate the immune response and induce beta cell death [2, 3]. Exposure of beta cells to these proinflammatory cytokines changes gene expression, to a major extent via modulation of the transcription factor nuclear factor (NF)-κB [1, 2]. 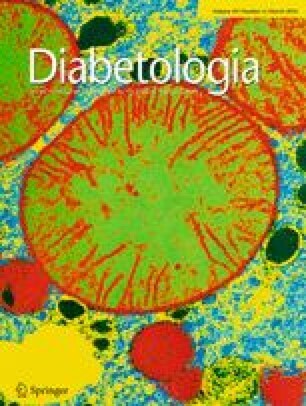 Inhibition of NF-κB signalling in mouse beta cells in vivo protects against multiple low-dose streptozotocin-induced diabetes , while mice with constitutive NF-κB activation in beta cells spontaneously develop insulitis and immune-mediated diabetes . In addition to regulating proinflammatory responses, NF-κB activation is also pro-apoptotic to beta cells [1, 2, 6, 7, 8]. Conversely, NF-κB inactivation in beta cells from NOD mice accelerates the disease . This is probably related to the prolonged inhibition of the expression of NF-κB-dependent antiapoptotic proteins such as XIAP and A20 [9, 10]. Polymorphisms in the NFKB gene have been identified in type 1 diabetic patients, supporting a role for this transcription factor in the pathogenesis of the human disease . This is surprising, since in most other cell types NF-κB plays an antiapoptotic role . The NF-κB family comprises the proteins p50/precursor p105, RelA, c-Rel, RelB and p52/precursor p100 . While p105 and p100 are inhibitory proteins, their respective mature forms, p50 and p52, function as active transcription factors. The two major NF-κB pathways are the canonical and non-canonical pathways . The canonical pathway is activated by proinflammatory agents such as cytokines, which bind to specific receptors and activate the inhibitor of κB (IκB) kinase (IKK) complex (IKKβ, IKKα and NEMO) . This leads to phosphorylation and degradation of the inhibitory IκB proteins (e.g. IκBα), releasing NF-κB proteins to form dimers that modify gene transcription . The non-canonical pathway, which was originally associated with immune cell differentiation, maturation and survival and osteoclastogenesis [13, 14, 15], is activated via a subset of receptors from the TNF family . Ligand binding activates NF-κB-inducing kinase (NIK) and the IKKα/IKKα complex, triggering phosphorylation-mediated ubiquitination of p100 and processing to the mature p52 subunit, which, with RelB, forms the main NF-κB dimer of the non-canonical pathway . While the canonical pathway of NF-κB activation is triggered in minutes, the non-canonical signalling is slower and depends on de novo protein synthesis . Up to now, all available information regarding the role and regulation of cytokine-mediated NF-κB activation in beta cells has focused on the canonical pathway [2, 16, 17, 18]. However, crosstalk between the canonical and non-canonical pathways might exist [13, 19]. Therefore, the aims of this study were to investigate whether proinflammatory cytokines associated with the pathogenesis of type 1 diabetes activate the non-canonical pathway in beta cells and, if so, to examine the regulation of this pathway and the consequences of its activation on NF-κB proinflammatory and apoptotic responses in these cells. Three-month-old male Wistar rats (Charles River Laboratories, St Germain sur L’Arbresle, France) were housed and handled according to the Belgian Regulations for Animal Care and with permission from the local ethics committee. Pancreatic islets were isolated and primary beta cells were FACS-purified (FACSAria, BD Bioscience, San Jose, CA, USA), isolated and cultured as previously described . EndoC-βH1 cells, kindly provided by R. Scharfmann (University of Paris Descartes, Paris, France) , were cultured as previously described . INS-1E cells (provided by C. Wollheim, University of Geneva, Geneva, Switzerland) were cultured as previously described . The cytokine concentrations used were [22, 23]: recombinant human IL-1β (R&D Systems, Abingdon, UK) 10 U/ml for INS-1E cells and 50 U/ml for primary beta and EndoC-βH1 cells; recombinant rat IFN-γ (R&D Systems) 100 U/ml for INS-1E cells and 500 U/ml for primary beta cells; human IFN-γ 1,000 U/ml for EndoC-βH1; recombinant murine TNF (Innogenetics, Gent, Belgium) 1,000 U/ml for all cell types. MG-132 (Sigma-Aldrich, Diegem, Belgium) was used at 1 μmol/l . The small interfering (si)RNAs (30 nmol/l) used are listed in electronic supplementary material (ESM) Table 1, and transfections were performed as previously described [22, 23]. F-box and WD repeat domain-containing 7 (FBW7) overexpression (cDNA from Addgene, Cambridge, MA, USA) was achieved by transient transfection . Culture media were collected for nitrite determination (nitrite is a stable product of NO oxidation) . The percentage of viable, apoptotic and necrotic cells was determined using the DNA-binding dyes propidium iodide (PI) (5 μg/ml, Sigma-Aldrich) and Hoechst 33342 (HO) (5 μg/ml, Sigma-Aldrich). A minimum of 500 cells were counted in each experimental condition by two independent researchers, one of whom was unaware of the sample’s identity . In all analysed experiments, the necrotic levels were low and did not change between different conditions (data not shown). Poly(A)+ mRNA was isolated and reverse transcribed as previously described . The real-time RT-PCR amplification reaction was performed using SYBR Green and compared with a standard curve . Expression values were corrected for the housekeeping gene GAPDH [2, 23]. The primers used are listed in ESM Table 1. Cell lysates were obtained as previously described [8, 23]. Supernatants were precleared using protein G-Sepharose beads (GE Healthcare, Diegem, Belgium) for 1 h at 4°C. Total protein (1 mg/ml) was incubated with anti-p100, anti-Myc or anti-HA antibodies overnight, followed by 2 h incubation with protein G-sepharose beads at 4°C. Beads were washed with lysis buffer, resuspended in Laemmli buffer and resolved on SDS-PAGE. Nuclear and cytoplasmic extracts from cells were obtained as previously described . For total cellular extracts, cells were washed with cold PBS and lysed in Laemmli buffer. Western blot analysis was performed as previously described . The antibodies used are listed in ESM Table 2. Images were acquired using ChemiDoc (Bio-Rad, Temse, Belgium) and analysed using ImageJ 1.49 software (http://imagej.nih.gov/ij/) . Protein expression was corrected by expression of the loading control proteins α-tubulin, GAPDH or fibrillarin. Cells were cotransfected with the internal control pRL-CMV encoding Renilla luciferase (Promega, Madison, WI, USA) and the pNF-κB-luciferase construct (BD Bioscience), together with the control siRNA (siCTR) or specific siRNAs against NFκB2, FBW7 and/or β-transducin repeats-containing protein (βTrCP). Sample preparation and measurement of luciferase activity were performed as previously described . Western blot and RT-PCR were corrected for the loading controls or housekeeping genes, respectively, and were normalised by the highest value in each experiment. Data are presented as means ± SEM. Comparisons were performed using a two-tailed paired Student’s t test or by ANOVA followed by a paired t test with Bonferroni correction for multiple comparisons. p < 0.05 was considered statistically significant. To verify whether IL-1β plus IFN-γ induce the non-canonical NF-κB pathway in beta cells, we analysed time-related changes in p100 expression and p52 nuclear translocation in INS-1E cells. Protein levels of p100 increased in the cytoplasm after 4 h cytokine treatment and remained elevated for up to 24 h (Fig. 1a). p100 is primarily cytoplasmic , but after 4 h of cytokine treatment it accumulated in the nucleus, indicating shuttling between the two compartments (Fig. 1a). Elevated levels of p100 resulted in increased p52 generation and its progressive nuclear translocation, with a peak at 24 h (Fig. 1a,b). Similar results were observed with IL-1β or TNF alone; TNF is another cytokine involved in NF-κB activation and beta cell dysfunction in type 1 diabetes (ESM Fig. 1a,b). IL-1β plus IFN-γ treatment also increased NIK protein expression by 3.5-fold (Fig. 1c,d). NFκB2 knockdown with two specific siRNAs resulted in a 50% decrease in NF-κB activity after IL-1β plus IFN-γ treatment in INS-1E cells (Fig. 1e and ESM Fig. 1c–e). Since both siRNAs provided similar results, most subsequent experiments were performed using Nfkb2#1 siRNA. Knockdown of NFκB2 in primary beta cells also resulted in a significant decrease of NF-κB activity after IL-1β plus IFN-γ exposure (Fig. 1f). Inhibition of NFκB2 protected INS-1E cells and primary beta cells from cytokine-mediated apoptosis (Fig. 1g,h). Silencing of NFκB2 in INS-1E cells affected neither the expression of Nfkb1 (ESM Fig. 1f) nor the cytokine-mediated degradation of IκBα (ESM Fig. 1g–i), confirming the specificity of the siRNAs used in this study for the non-canonical NF-κB pathway. Since we observed that the non-canonical NF-κB pathway is a relatively late response (starting at 4 h [Fig. 1a,b], as compared with 10 min for the canonical pathway ), we tested whether this pathway regulates the expression of ‘late’ NF-κB-targeted genes. NFκB2 silencing (Fig. 2a) did not alter the expression of ‘early’ genes (induced 2 h after cytokine exposure), such as A20 (also known as Tnfaip3), Ikba (also known as Nfkbia), Mnsod and Cxcl1 (also known as Gro1) (Fig. 2b–e), while NFκB2 knockdown drastically decreased the mRNA expression of the ‘late’ genes (induced from 4 h onwards) Ccl5, Ccl19, Fas, Cxcl12 and Inos (also known as Nos2) (Fig. 2f–j). This was accompanied by a significant decrease in NO production (Fig. 2l). Ccl2 mRNA expression was strongly induced after 8 h of treatment, but was not different in NFκB2-silenced cells compared with siCTR-transfected cells (Fig. 2k). It has been previously reported that the E3-ligase FBW7 regulates the NF-κB pathway in cancer cells [28, 29, 30]. We observed that IL-1β plus IFN-γ decreased Fbw7 (also known as Fbxw7) mRNA expression in INS-1E, rat primary beta cells and EndoC-βH1 cells (Fig. 3a–c). The transcription factor CCAAT/enhancer-binding protein-δ (C/EBPδ) directly inhibits FBW7 expression in murine cancerous cells . We observed that the IL-1β plus IFN-γ-mediated decrease in Fbw7 expression in INS-1E cells correlated with an increase in Cebpd gene expression (ESM Fig. 2a,b). C/EBPδ knockdown prevented cytokine-mediated Fbw7 downregulation (Fig. 3d), suggesting a direct link between induction of C/EBPδ and downregulation of FBW7. A pronounced increase in NF-κB activity was observed in FBW7-depleted cells after IL-1β plus IFN-γ exposure (Fig. 3e–g and ESM Fig. 2b–e). The potentiation of NF-κB activation was also observed in FBW7-silenced INS-1E cells treated with IL-1β or TNF alone, indicating that this regulation is independent of IFN-γ (Fig. 3h). In line with these results, FBW7 overexpression decreased IL-1β plus IFN-γ-mediated NF-κB activation (Fig. 3i). In tumour cells, FBW7 regulates the non-canonical NF-κB pathway by targeting p100 for degradation [28, 29, 30]. Analysis of cytoplasmic fractions from FBW7-depleted cells revealed higher levels of the inhibitory protein p100 upon IL-1β plus IFN-γ treatment (Fig. 4a,b). p100 accumulation resulted in increased levels of p52 protein in the nucleus (Fig. 4a,c). Double knockdown of FBW7 and NFκB2 prevented the potentiating effect on NF-κB activation induced by cytokines after FBW7 depletion (Fig. 4d and ESM Fig. 2f,g). Processing of p100 to p52 may be mediated by another E3 ligase, βTrCP . FBW7 silencing significantly increased NF-κB activity, which was inhibited by concomitant knockdown of FBW7 and βTrCP (Fig. 4e, ESM Fig. 3). These experiments suggest a role for βTrCP in p100 processing in beta cells, and support the hypothesis that the potentiating effects of FBW7 depletion on NF-κB are mediated via the cleavage of p100 to p52 and its translocation to the nucleus. Indeed, a direct interaction between FBW7 and p100 was observed in co-immunoprecipitation experiments (Fig. 4f,g). FBW7 depletion, however, did not change IL-1β plus IFN-γ-induced IκBα degradation (ESM Fig. 2h,i), excluding regulation of the canonical pathway. Expression of the ‘early’ genes A20 and Ikba after FBW7 knockdown (Fig. 5a) was comparable in both transfected groups (Fig. 5b,c), while expression of the ‘late’ genes Ccl5, Ccl19, Fas, Cxcl12 and Inos increased (Fig. 5d–h). Moreover, FBW7 silencing enhanced NO production (Fig. 5j). As observed in NFκB2-silenced cells, Ccl2 expression was not modified between the transfection conditions (Fig. 5i). Overall, the observed effects of FBW7 silencing were opposite to those of NFκB2 silencing (Fig. 2), confirming that FBW7 hampers non-canonical NF-κB responses. FBW7-silenced INS-1E, EndoC-βH1, and primary beta cells were sensitised to IL-1β plus IFN-γ-induced apoptosis (Fig. 6a–c). Double knockdown of FBW7 and NFκB2 or FBW7 and βTrCP partially protected against FBW7-knockdown mediated apoptosis (Fig. 6d,e), suggesting that the increased beta cell death after FBW7 depletion is at least partly due to activation of the non-canonical NF-κB pathway. NF-κB controls the expression of genes regulating cell survival, development, differentiation and metabolism, and is crucial for immune responses [13, 14]. In the context of type 1 diabetes, beta cell-mediated NF-κB activation contributes to its own demise [1, 4, 5, 7]. The proinflammatory role of NF-κB is similar in beta cells and other cell types, but the transcription factor is unusually pro-apoptotic in beta cells [7, 8, 12]. The reasons for this susceptibility of beta cells to NF-κB have remained a puzzle in the field. In the present study, we found that non-canonical signalling is atypically activated by IL-1β (alone or in combination with IFN-γ) or TNF, regulating late NF-κB-mediated pro-apoptotic and proinflammatory responses in beta cells, which may provide an explanation for the predominantly pro-apoptotic effects of the transcription factor in beta cells. Ligands such as receptor activator of NF-κB (RANK) and membrane-bound, but non-soluble TNF have been shown to activate the non-canonical NF-κB pathway [15, 32], while proinflammatory cytokines such as IL-1β and soluble TNF are considered to preferentially activate the canonical NF-κB pathway [7, 8, 17]. By using an siRNA targeting Nfkb2, we observed that both IL-1β (alone or in combination with IFN-γ) and soluble TNF activated the non-canonical NF-κB pathway in pancreatic beta cells. These findings are intriguing and have not been previously described in other cell types. The Nfkb2 siRNAs used in this study were specific and did not interfere with the canonical NF-κB pathway, as judged by their lack of effect on the expression of Nfkb1 or IκBα degradation in response to IL-1β plus IFN-γ. In line with our findings, Malle et al showed that soluble TNF induces the processing of p100 to p52 in mouse islets, while Wolden-Kirk et al observed p52 activation in mouse islets exposed to IL-1β plus IFN-γ [33, 34]. The canonical and non-canonical NF-κB pathways were initially believed to fulfil different functions, but recent studies have revealed crosstalk between them [13, 19]. Thus, the increase in NFKB2 expression by the canonical pathway positively regulates the non-canonical pathway by providing a greater amount of precursor p100 for p52 generation . Accordingly, exposure to IL-1β (alone or in combination with IFN-γ) or TNF increased the expression of both Nfkb2 mRNA and p100 protein in INS-1E cells. A central signalling element is the activation/stabilisation of NIK . We observed low NIK protein levels in resting cells, which increased several-fold upon cytokine treatment. The IKK complex containing NEMO and IKKβ plays an important role in the maintenance of the low basal levels of NIK, thus suppressing basal non-canonical NF-κB signalling . IL-1β mediates IKKβ degradation in beta cells, leading to IKKα homodimer activation . It is thus conceivable that an IL-1β-mediated decrease in IKKβ in beta cells contributes to increased NIK protein levels. Stabilised NIK phosphorylates/activates IKKα, resulting in p100 processing and non-canonical NF-κB activation . We suggest that an IL-1β plus IFN-γ-mediated increase in IKKα complexes , together with increased expression of NIK and p100, contributes to the activation of the non-canonical pathway in beta cells (ESM Fig. 4). This stabilising effect of IL-1β plus IFN-γ on NIK protein has not previously been described in other cells types, but overexpression of mutant NIK protein has been reported to inhibit IL-1β-mediated NF-κB activation in 293 EBNA cells , indicating the impact of NIK in cytokine-mediated NF-κB activation in these cells. NF-κB activation occurs in distinct waves, triggering the expression of ‘early’ and ‘late’ genes [16, 37]. The general pattern of NF-κB activation in beta cells is not oscillatory, but sustained . Based on the present results, we propose that the non-canonical pathway contributes to the ‘late’ response. Accordingly, NFκB2 silencing hampers the induction of ‘late’ NF-κB genes without affecting the expression of ‘early’ genes. Inducible NO synthase (iNOS) and Fas, important regulators of beta cell apoptosis, are regulated by the non-canonical NF-κB pathway [1, 6, 38]. Although Fas upregulation is mostly related to cell death in vivo [39, 40], decreased iNOS expression and NO production could contribute to the decreased apoptosis in NFκB2-silenced cells [1, 6, 38]. Importantly, the non-canonical pathway enhances the expression of the chemokines Ccl5, Ccl19 and Cxcl12. CCL5 levels are elevated in serum of type 1 diabetic patients and contribute to the attraction of monocytes and neutrophils to the islets during insulitis [41, 42]. CCL19 levels are also increased during diabetes development and enhance the migration of dendritic cells and macrophages to the islets [43, 44]. CXCL12 levels are elevated in type 1 diabetes, and CXCL12 contributes to insulitis by stimulating the trafficking and homing of autoreactive B and T cells in animal models of type 1 diabetes [45, 46]. CCL19 and CXCL12 genes have been reported to be downstream of the non-canonical NF-κB pathway in other cell types [47, 48]. Although CCL2 is a ‘late’ gene, its expression was not modulated in NFκB2-silenced cells, supporting the hypothesis that both time and the type of dimer are important for NF-κB regulation . The E3 ligase FBW7 promotes p100 degradation in tumour cells, and FBW7 deficiency reduces NF-κB activation due to accumulation of this inhibitory protein [28, 29, 30]. In this study, we confirmed the FBW7–p100 interaction and increased p100 protein levels in response to FBW7 depletion in INS-1E cells. However, in contrast to the effects reported in tumour cells, FBW7 knockdown potentiated cytokine-mediated NF-κB activation, while its overexpression reduced this activity in beta cells. This might be due to the processing of accumulated p100 to p52 by the E3 ligase βTrCP, since p52 levels were increased in the nuclear fractions of FBW7-silenced INS-1E cells and concomitant knockdown of FBW7 and βTrCP reversed the effects of FBW7 on NF-κB activation. Fukushima et al reported decreased protein and gene expression of the canonical NF-κB targets NFKB1 and IKBA in FBW7-knockout cells, suggesting a role for FBW7 in canonical signalling . Our results argue against a similar mechanism in beta cells, since the increased activation of the NF-κB reporter gene (which can be induced by both pathways) observed in FBW7-silenced beta cells was abolished in cells silenced for FBW7 and NFκB2. Moreover, FBW7 knockdown did not alter Ikba mRNA expression or its cytokine-induced protein degradation. Finally, FBW7 deficiency modified the expression pattern only of NF-κB ‘late’ genes, regulated by the non-canonical pathway, but not of the ‘early’ genes (probably induced by the canonical pathway). Overall, these findings support a specific role for FBW7 in regulating the non-canonical NF-κB pathway in beta cells. We observed that proinflammatory cytokines induced Btrcp (also known as Btrc) gene expression  and upregulated Cebpd, leading to decreased Fbw7 expression. These events contribute to the activation of the non-canonical pathway by preventing p100 degradation, and therefore constitute another level of regulation of this pathway in beta cells (ESM Fig. 4). FBW7 knockdown exacerbated cytokine-mediated apoptosis, which was partially reversed by simultaneous silencing of FBW7 and NFκB2 or βTrCP. These data support a pro-apoptotic role for the non-canonical NF-κB pathway in beta cells. We conclude that induction of the canonical pathway by IL-1β plus IFN-γ triggers a cascade of events, leading to atypical activation of the non-canonical pathway. Beta cell-specific steps in this pathway include: (1) activation of the non-canonical pathway by IL-1β plus IFN-γ; (2) upregulation/stabilisation of NIK expression by these cytokines; (3) a stimulatory effect of FBW7 knockdown on NF-κB activation; and (4) downregulation of IKKβ by IL-1β . These events constitute a novel ‘feed-forward’ mechanism that might contribute to the particularly pro-apoptotic effect of NF-κB in beta cells (ESM Fig. 4). We thank I. Millard, A. Musuaya, S. Mertens and M. Pangerl (ULB Center for Diabetes Research, Brussels, Belgium) for expert technical assistance. EndoC-βH1 cells were kindly provided by R. Scharfmann (University of Paris, Paris, France). We are grateful to the Flow Cytometry Facility of the Erasmus Campus of the ULB and Christine Dubois for cell sorting. Work in the group led by AKC is supported by the JDRF (New York, USA; 1-2011-589), Actions de Recherché Concertées de la Communauté Française (ARC, Belgium; 20063) and National Funds from Scientific Research (FNRS, Belgium; F.4521.11). LFT received a fellowship from Coordenação de Aperfeiçoamento de Pessoal de Nivel Superior (5134/11–0). The research of FO is financed by Fundação de Auxilio a Pesquisa do Estado de São Paulo (2010/05587–1). The research of DLE was supported by the FNRS (T.0036.13), ARC (20063), the European Union (Framework Programme 7 of the European Community; 277713) and the JDRF (3-SRA-2014-32-S-B). AKC was a research associate from FNRS (2006-2015). KM, AKC, DLE and FO contributed to the conception and experimental design of the study and interpretation of the results. KM, MF, LFT and AKC carried out the experiments and/or helped with data analysis. KM and AKC wrote the manuscript. KM and AKC are responsible for the integrity of the work as a whole. All authors revised the article and approved the final version to be published.